I am so sad to say my 1 year term is up and this is my last past. It has been such a wonderful year of making new friends and sharing Great Impression Stamps with everyone out there. I am excited for the new girls starting their new terms with such a fun and wonderful group. With all that being said I am sharing a card I made using some yummy things sent to me from Mary. We did a Christmas swap sending each other some yummy goodies to create with. She sent me some yummy papers, washi tape, and this great sentiment. The stamp is called Said the Butterfly. I added the pearls to make the card a little more. She sent me a lot more goodies than what you see here and boy am I excited to play around with it! So said goodbye and a happy hello. Happy New Years to everyone. I can not believe it is almost 2013!!! I hope you all had a Merry Christmas! I did---I woke up here in Oregon to a beautiful coating of fresh white snow on the ground Christmas morning...what could be more perfect!?! Wowser the time has flown this year! I am looking forward to the coming year and all the fun ahead! 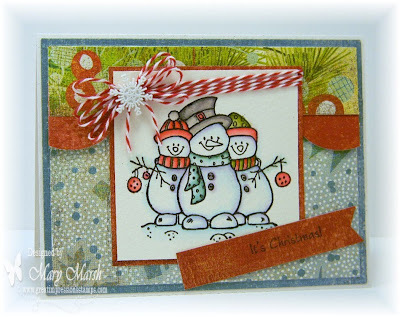 So here I am with a snowy creation to show you today! 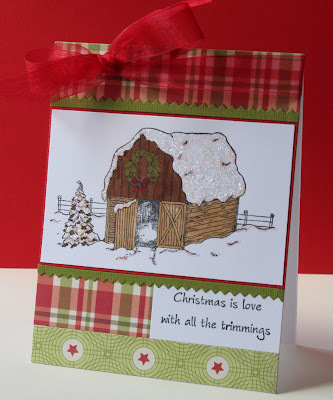 I used the very vintage style Sleigh Ride stamp along with the Snowy Trees stamp. I cut out the sleigh ride stamp at the top and added it on pop dots over the tree stamp that I stamped several times. It might be hard to tell, but the dimension and glitter is so pretty. The sentiment is computer generated and punched out with the SU! window word punch. I also used an EK Success snowflake border punch on the top and bottom of the image. I added tons of glitter (to the card and on to me) and a little twine too. Well, I am looking forward to sleeping in this morning and just hanging around in my pj's for while...no hurry to get anything done! I need to recharge after the holidays! Wishing you all a Happy New Year! 2013 here we come! Happy Friday and thanks for taking the time to visit the Great Impressions Blog. Hope your Christmas was a wonderful one and now we begin the countdown to the New Year. I ran out of Christmas cards and needed one to give to my neighbor along with some chocolate candy that I made for Christmas. So I decided to make a card for the New Year. To start my card I stamped my background with the Great Impressions Stamp - "Fireworks & Stars G303" in black ink and then I wet embossed. I layered that on a opal metallic paper. 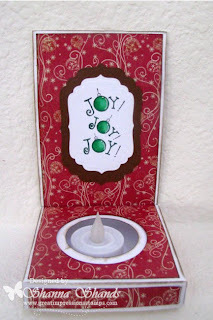 My 2013 is cut from a Sizzix alphabet set in the same silk opal metallic card stock. 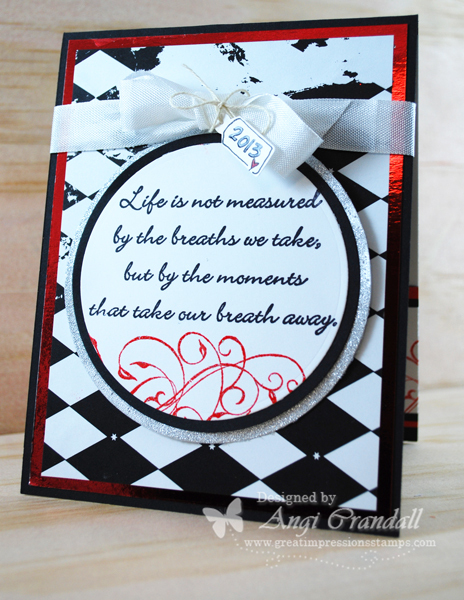 Layered that on black card stock and punched a few stars. My sentiment is "holiday hugs A143". That's my card for this week. If you have any New Years Eve celebrations- be safe. See you next Friday. Happy Last Thursday of 2012! My most recent order included a few stamps I've had on my wish list and, of course, I had to ink up some of my new rubber and show them off on a project! I've been thinking of the highs and lows of my year, of the goals I accomplished and the ones I've yet to set. I can't believe how fast this year has passed! Already it's time for my last post as a member of the Great Impressions Stamps Design Team. It has been wonderful to work with a GREAT company with such fabulous products & service, not to mention the talented team! 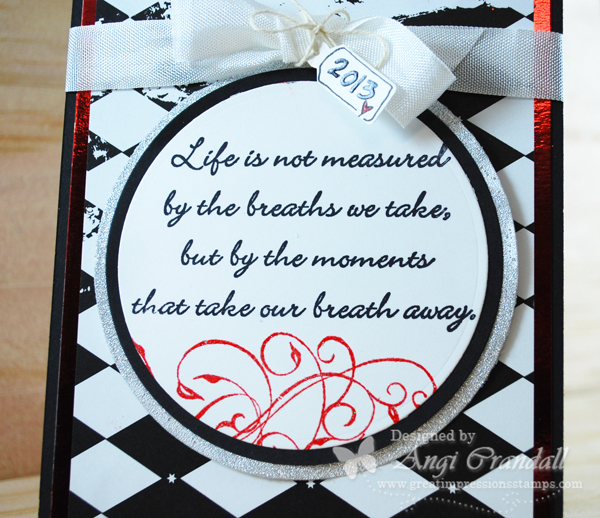 With those thoughts on my mind, Life is Not Measured... (F252) is the perfect sentiment for my New Year's card. 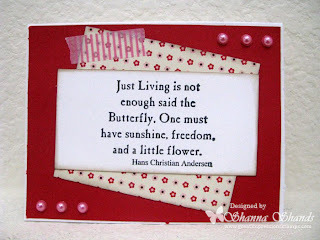 I used Simple Elegance (H185) along the bottom edge of my sentiment panel. 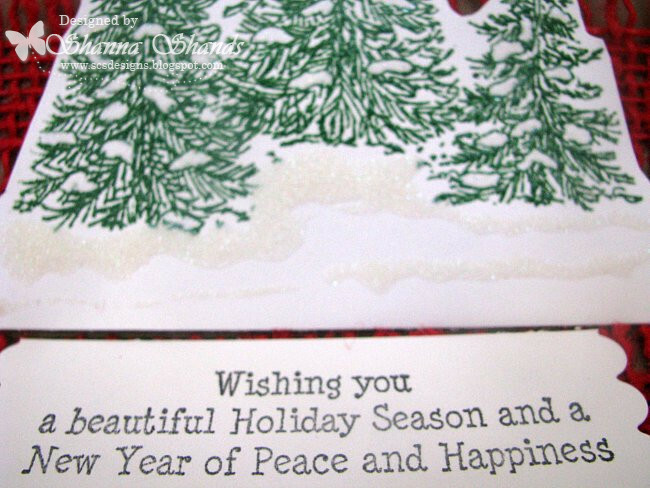 The flourish is embossed with clear embossing powder and glitter. Embossing with powders is another easy way to add texture and interest to a simple card. 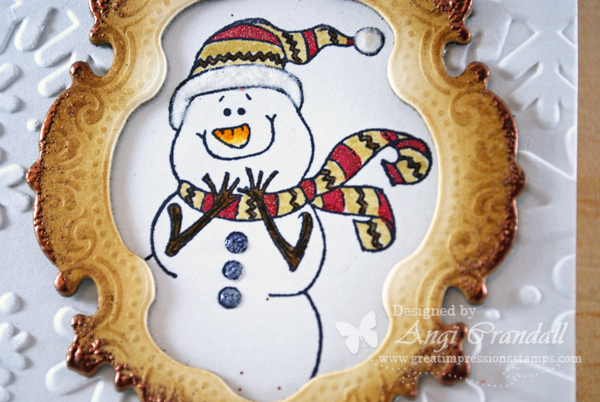 The tiny tag is handwritten with a Glaze pen - goes on wet and looks like the writing was embossed when dry. These pens are great for adding personal touches to patterned papers. 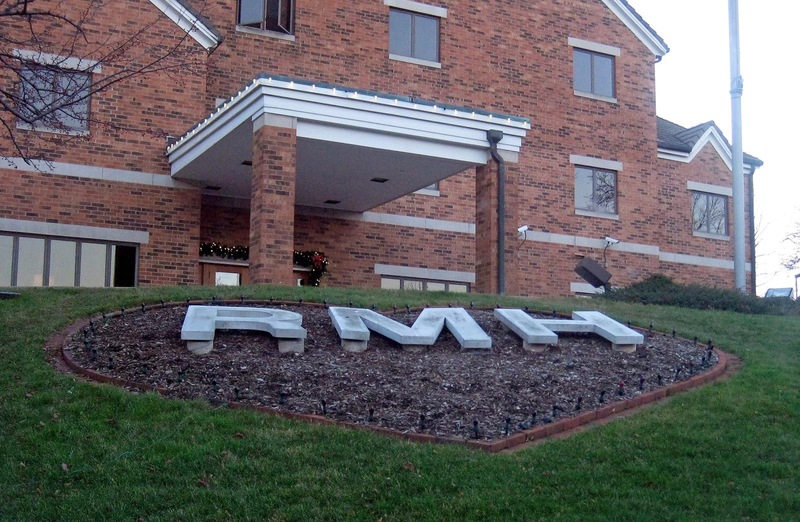 I hope that you have enjoyed your visit today and your 2012 has had more ups than downs! Thank you for your support, comments & participation (you still have a couple of days to link up to the december challenge!) and may 2013 be your best year, yet! and a Creative New Year! Merry Christmas Eve everyone. I really hope everyone has made it safely to their destinations and that people get to spend time with their loved ones. I know I am excited to spend Christmas with my family as I haven't gotten to the last two years. So all my Christmas cheer and baking has been exciting. So today I am sharing a little holiday cheer with you. 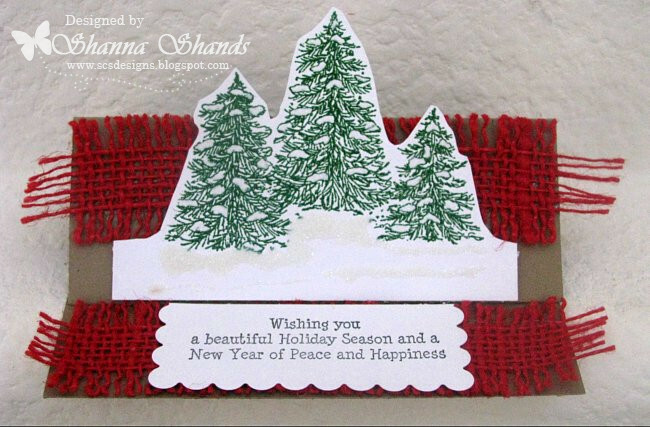 I used the stamp Peace and Happiness and the stamp Snowy Trees. 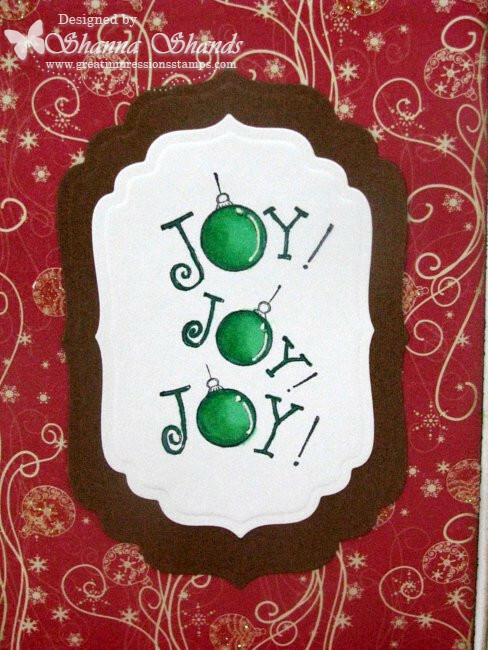 I stamped the image with embossing ink and embossed the image with Forest Green EP, added glitter using glossy accents, and embellished with jute ribbon. I made this a simple easel card. PLEASE BE SAFE FOR THE HOLIDAYS!!!!! Hello my wonderful crafting Friends! 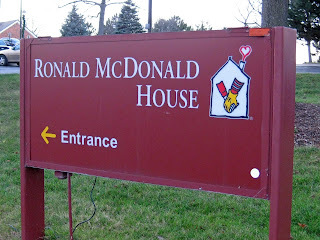 experience at the Ronald McDonald House. families staying at the house! upon hours a week made me feel warm and welcome when I arrived. Notice the heart around the initials. their privacy but my heart ached for these children and their parents. of you I think we had cards for just about every occasion! 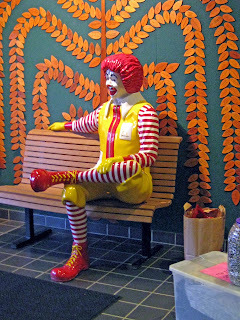 went on my way with a little wave to Ronald himself. with their families and keep them loved and safe. Blessings to you all this Holiday Season. precious children in your prayers. Really...today I would love to be in my jammies, sipping my cocoa and eating my oaties and surfing all your great crafty creations, but this is the last day to do final preparations for the holidays...AND then I am wearing my jammies and relaxin' LOL! As we wind down 2012, I would like to thank you for all your 'crafty' friendship! I think we are all anxious to see what 2013 will bring as well! 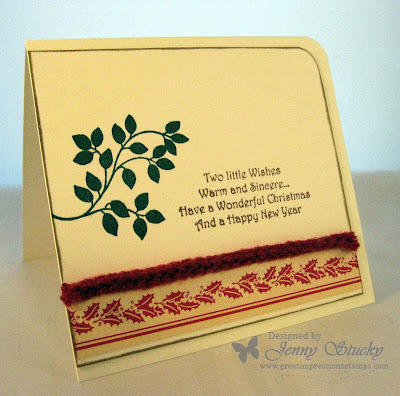 This was a quick Christmas card-I stamped and cut out the wreath with a scalloped nestie and mounted it with pop dots on an embossed background. 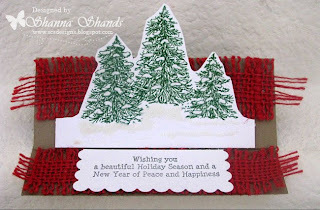 I added a quick little plaid ribbon and a pretty Christmas greeting. Viola! Wishing you all a very Merry Christmas! My best to you and yours! Happy Friday and thanks for taking the time to visit the Great Impressions Blog. The countdown continues and it's only 4 days until Christmas. Hopefully your plans are going well and your finishing as expected. If not, don't stress. Just finish what you can and let go of the rest. Enjoy this time with your family and friends. I still need a few tags for gifts, and I just can't bring myself to buy them. Not with all the supplies I have to make them. So I look for easy ways to put some together quickly. The Great Impressions sentiment stamps make great gift tags. 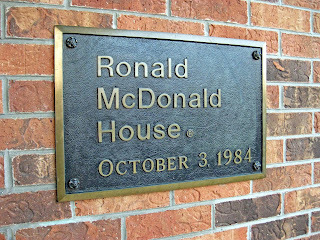 For this one I used the stamp E512- Have Yourself. 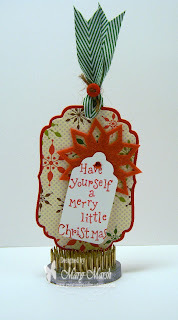 I stamped it on a Sizzix die cut tag and added it to a larger die cut tag. My larger tag is cut in red card stock and then some patterned paper. 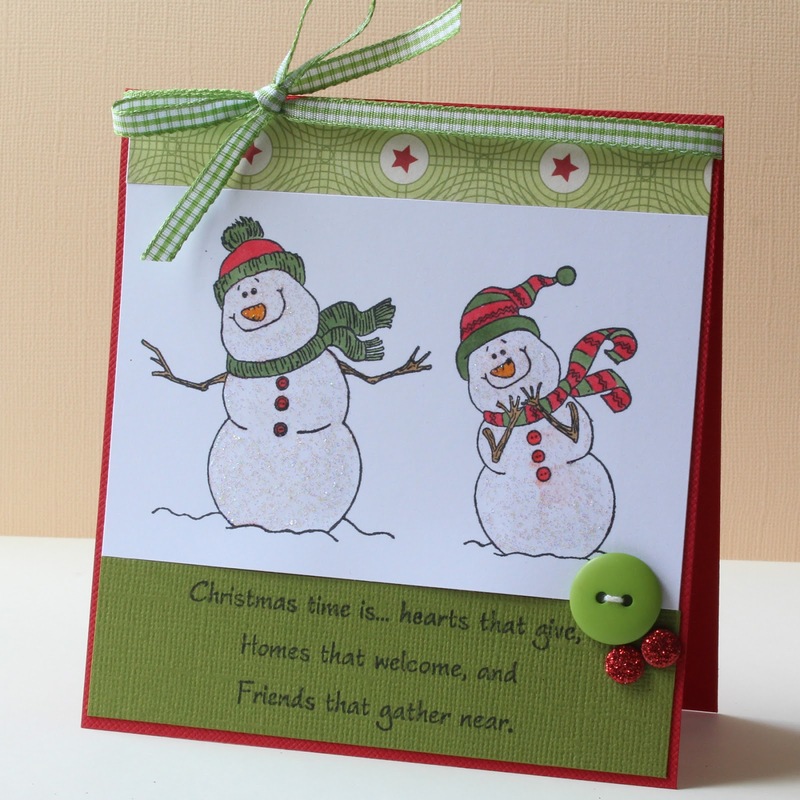 I added a felt snowflake some green chevron ribbon and a red button. That completed the tag and I like it better than a store bought one. And, I didnt have to fight the crowds or take what was leftover. That's it for me for this Friday. See you next week. Merry Christmas to all and to all a good night!! Happy Thursday! Only 5 days till Christmas...and I'm sitting here typing up this post while a blizzard winds down outside my window! I love days like this where I can start a fire, grab some hot cocoa and take the time to get some crafting done. Even though we are in the last stretch of the holidays for 2012, I'm already looking ahead to 2013 birthdays. 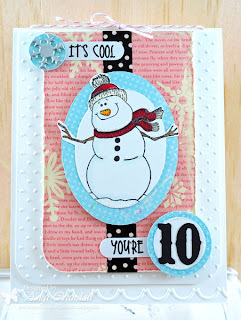 My youngest daughter will be turning 10 in January and wants a snowman/rainbow party! This is quite the change from the normal glittery princess event, but I like a challenge! 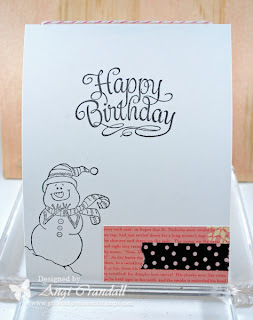 And it's Swirly Happy Birthday (E367) paired with Snow Adorable (E774)! Such a cute stamp. I couldn't resist putting him on the inside. He makes me smile! Thank Yous are always an important part of birthday celebrations around my house. If you would like to see the snowman Thank You tags my little girl will be using stop by my blog when you're finished here! Thanks for stopping by today! Happy Holidays! I used three Great Impressions stamps today: Simple Elegance (probably my favorite Great Impressions stamp, well, ever), Happy Valentine's Day, and Jar of Candy Hearts. The cardstock is Papertrey Ink's Sweet Blush, Aqua Mist, Plum Pudding, and Stamper's Select White. 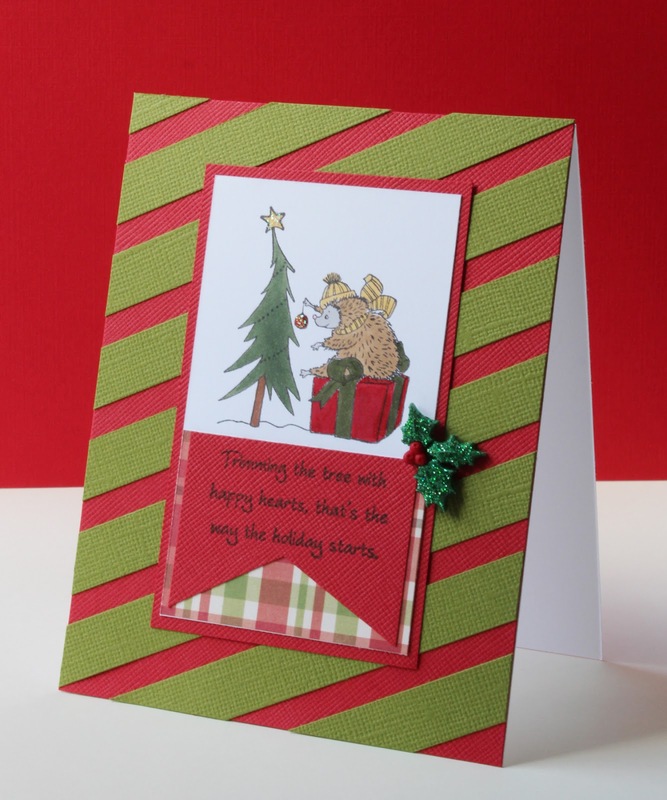 I found a big bin of ribbon that had been hiding behind some buttons, and the striped ribbon was perfect for my card. I don't know where I got it, but I love the soft pastel colors & horizontal stripes. Aren't the glittered hearts fun? I used heart dies by PTI and covered them in Tombow liquid glue before dumping some Martha Stewart crystal fine glitter on top. I tried using Stickles first, but the paper was too warped to work with, and Stickles take a while to dry. The Tombow glue dries quickly and the glitter really sticks to it. 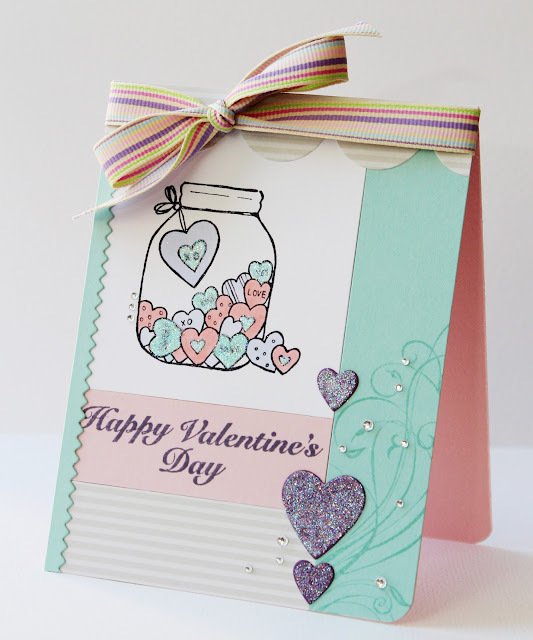 I also used Tombow glue and Martha Stewart glitter on the candy hearts in the jar to add some sparkle. Have a wonderful week and thanks for stopping by! How is everyone cooping with getting ready for the holidays??? Does everyone have enough cocoa where it is cold and enough lemonade where it is hot???? 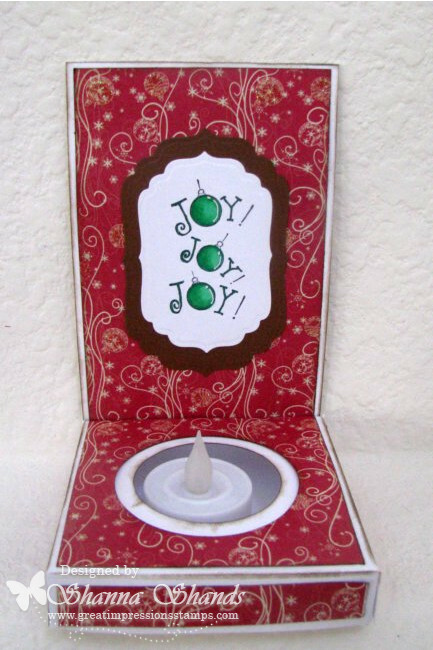 Today I used the stamp Joy with Bulbs to add to my tea light holder. I couldn't find the right glass container to put in here with the candle. I am sure there are tons out there due to the holidays but finding the right one I should have been a little better prepared. 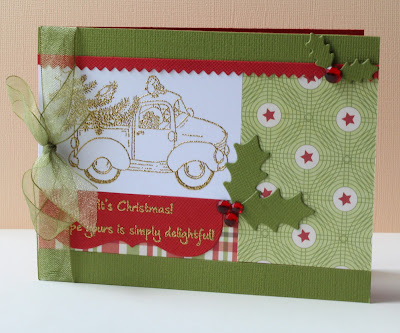 I used a spellbinder die to cut out the stamp. I have no clue what papers these were I just grabbed them out of my Christmas stash. 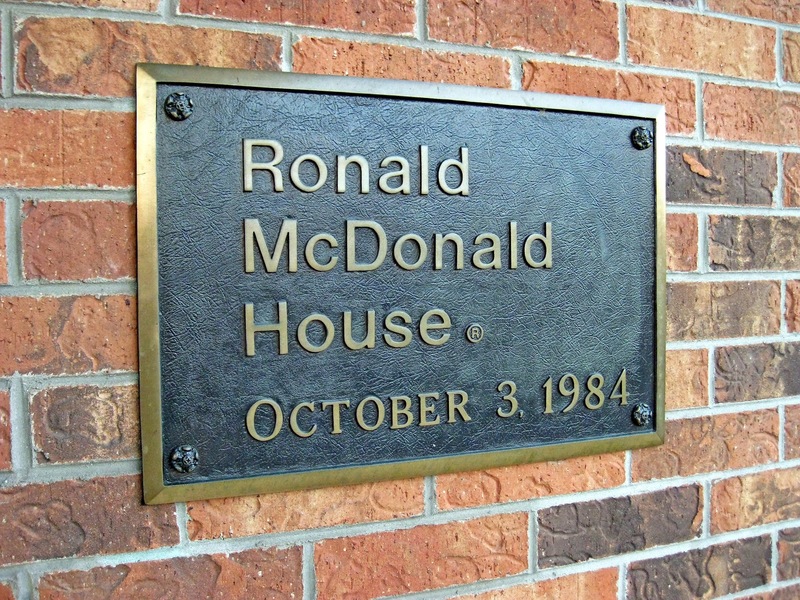 This is a fun project and easy for anyone to create. 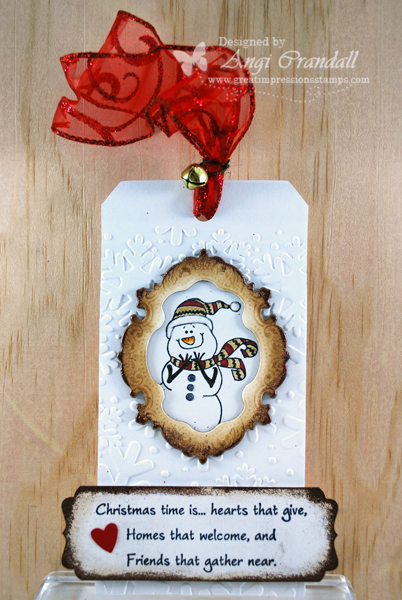 It is a great piece for the mantle and you can create a bunch of them easy as gifts to give. Maybe even get a few stamps for stocking stuffers! One more Jammie Saturday here on my blog...I hope you take the time to sit back and enjoy the holidays and are not going crazy! 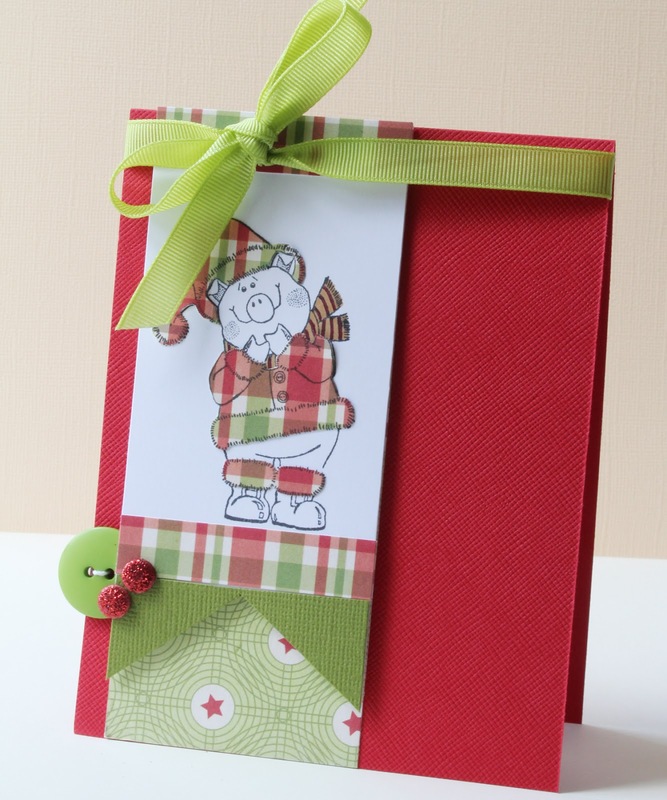 Today I am showing you another darling Christmas Mice stamp paired with some fun MME Christmas papers! 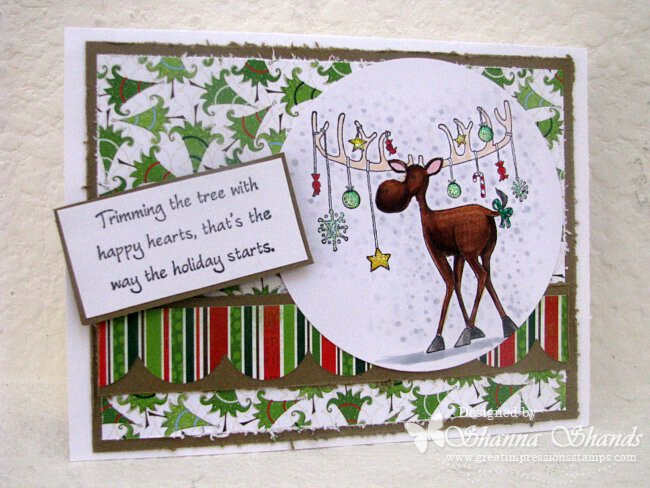 I used a sentiment that said 'Wishing you Holiday Hugs' and you can see I only used the last part of the stamp. I added some glitter (and yes I made a mess darn it)! I also added in a pretty bow and some white pearlies to finish it off! 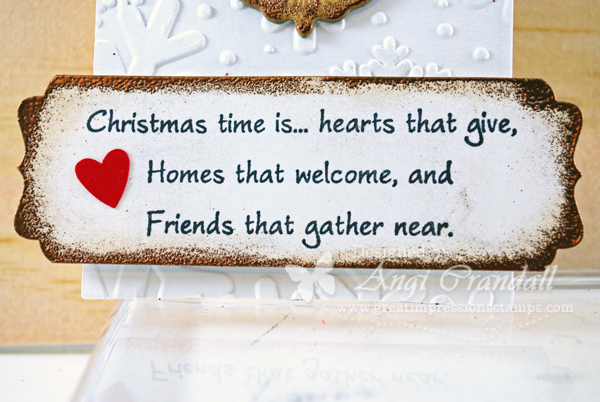 Wishing you the best of days today and sending you all a big Holiday Hug! Happy Friday and thanks for taking the time to visit the Great Impressions Blog. The countdown to Christmas continues and it's now only 11 days away. Hope all your plans are on target. 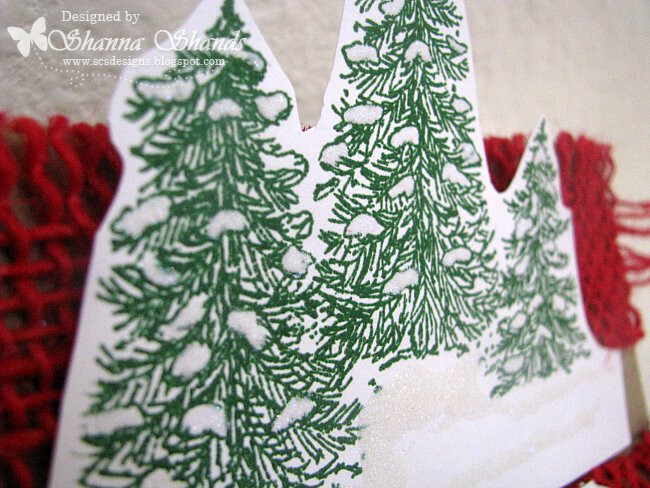 I have another Christmas card to show you today. I wanted to experiment with distress markers and an aqua painter water brush. 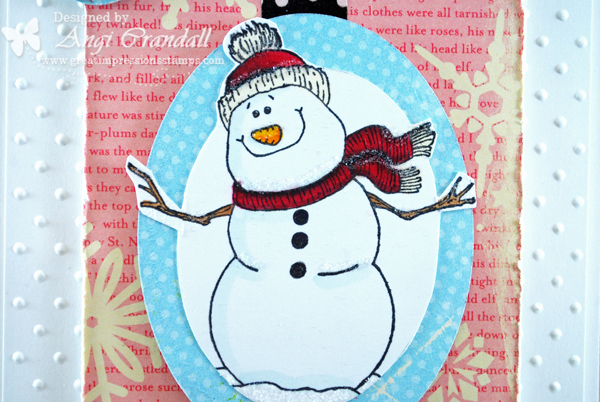 This super cute snowman stamp - "frosty Friends G289 was the perfect stamp to use. I paired my image up with patterned paper from the Basic Gray "fruitcake collection". 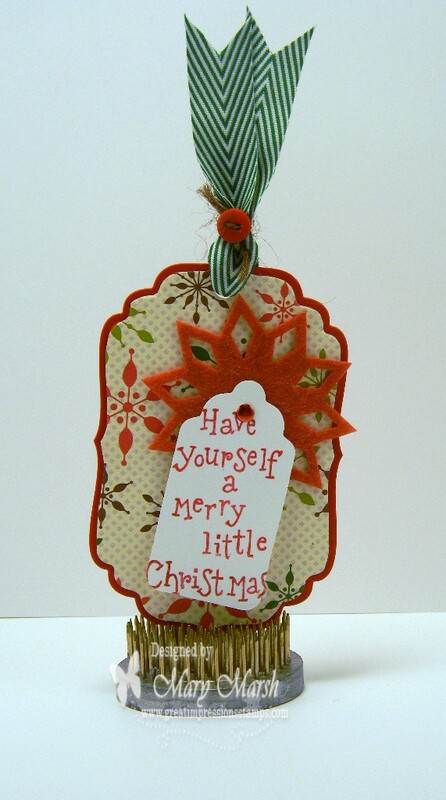 Added a twine bow, a banner flag with my sentiment from the stamp "It's Christmas - D453 and that completed my card. This would also make a great card for a winter birthday or a Christmas thank you note. All the stamps are available in the online store. Paper: naturals white, water color paper, basic grey paper "fruitcake collection"
Happy Thursday, Everyone! 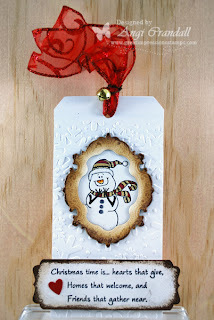 Angi here with a simple Christmas tag - with texture, of course! I've got a few more gifts to finish up, so these tags are going to be perfect! The Distress Markers are great for this image! A little color, a little water, some sparkle with a Spica... Isn't Snow Adorable (E774) so cute?! I love the texture of this frame. I inked it up with Vintage Photo Distress Ink to highlight the raised design. I felt like it needed just a little bit more character (see my issues with CAS? lol), so I tapped the edge with a Versamark pad and added some copper embossing powder. It's in the details, right? But if I had stopped, you wouldn't have gotten to see this lovely sentiment Hearts That Give (E775), dressed up with more copper embossing powder and a tiny red punched heart! I backed this tag with a plain white one, so I can write 'To:' and 'From:' and leave a little love on the back. The ribbon is wired and tied with a piece of jute twine and a jingle bell. Snowmen are great winter images! You could use any of these Great Impressions' snow related stamps for more than just Christmas...hmmm...maybe thank you or winter birthday? It's been great visiting with you today! Thanks for stopping by! Good morning! I hope everyone is having a great week. I am proud to say that my Christmas cards are finished and most are going in the mail today! I think this is the earliest I have ever gotten my cards mailed. It is usually December 23rd, or worse, the day after Christmas, when they finally make it into the mailbox! 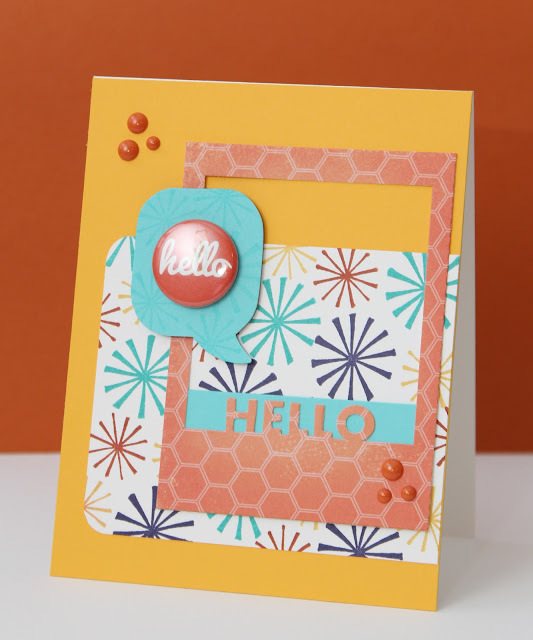 Because my cards are done, I decided to create a bold and bright "Hello" card using a fantastic Great Impressions stamp. I used Great Impressions Twirly Backgrounds that I cut apart (eek!) to make three individual stamps. For this card I only used the large and small star burst images. The large star burst was stamped in Concord Crush and Bermuda Bay, and the smaller star burst was stamped in More Mustard and Cajun Craze. I rounded two corners of the white panel before adhering it to a piece of More Mustard cardstock. The speech bubble is chipboard, made by Pebbles Inc., that I traced onto Bermuda Bay cardstock and stamped with VersaMark ink. The "HELLO" frame is by KI Memories. Isn't the Twirly Background stamp fun? And cutting apart my stamps is becoming less... painful every time I do it. 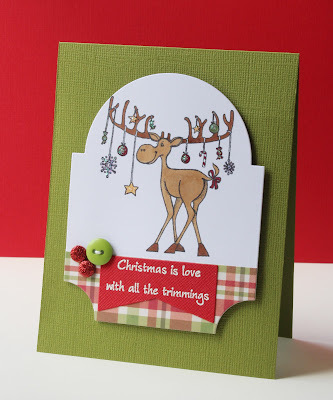 In this case, it made stamping the multicolored background so much easier. No masking, no sticky notes. I just alternated stamping between the four colors and I was done! Today's card was inspired by this week's Retro Sketches challenge. That's it for me today. Thanks for stopping by! Are you all prepared for the holidays? my guests bringing some side dishes. It's so much easier when everyone contributes. I think Santa is going to make a guest appearance for the little ones. So fun to experience Christmas through their innocent eyes. and yarn trim for texture finishes off my card. Have you entered our December challenge yet? Anything goes...and you are good to go! (grin). Happy Happy Monday to everyone out there! 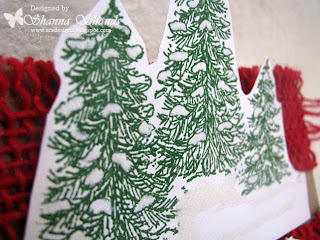 I am so excited to share with you a fun Christmas card I made using stamps from our newest addition to the Great Impression family of stamps. 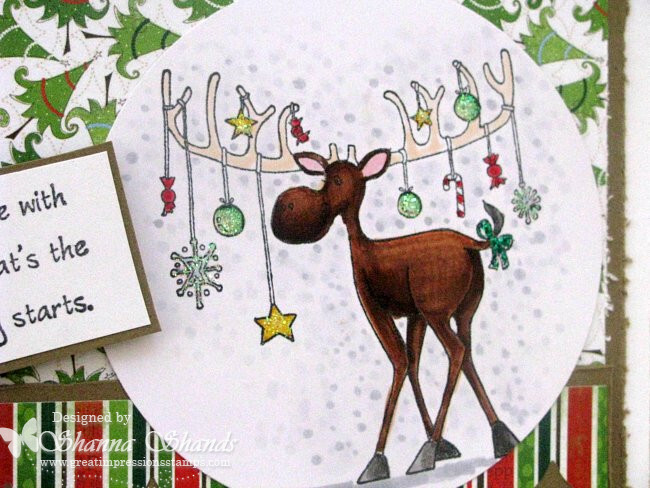 I cut Merry Kiss Moose out using a circle spellbinder die and colored him with copics and added some stickles to his shiny ornaments. Here you can see the whole card and I love that I was able to use this fun Bo Bunny paper for the card. The Latest and Greatest - Great Impressions Stamps! Good Sunday Morning Fellow Crafty Friends! Boy, do I have a treat for you today! 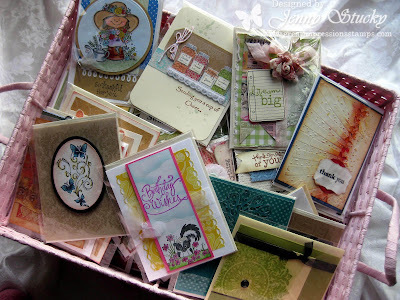 of the latest releases from Great Impressions Stamps! The ubber talented Erin has such a fun CAS style. of card making look so easy! When I know it's anything but! All of these stamps are now available at our on-line store! While you are shopping, why not sign up for our newsletter. You will be the first to know what's new at Great Impressions Stamps! Did you see what else is new?? Great Impressions Stamps has gone Social! We now have our own Face Book page! 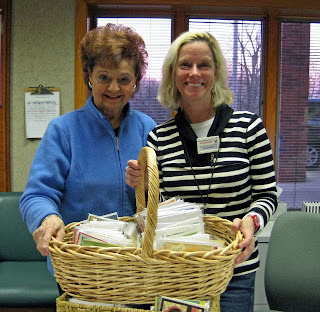 and she is offering up some prizes if you "Like" us. Wishing you a wonderful AND stress free week! 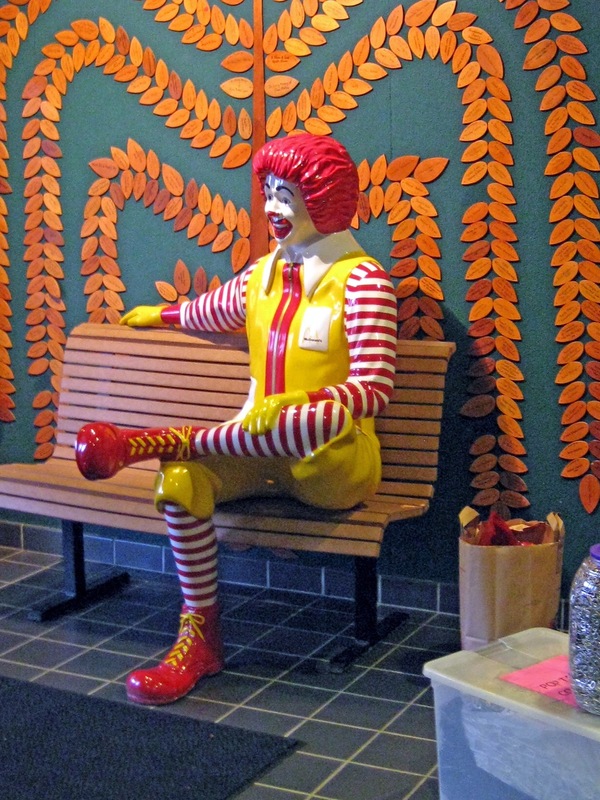 December Challenge and Our Top Pix!